1. Miracle Gel (8 oz bottle): This unique cellulite treatment gel which can be used prior to aloe vera wrap and after the clay or sea weed type wraps. 2. Amino Acid Spray (8 oz bottle): Aloe Vera spray enriched with collagen intended for use after completing sea clay body wrap and prior to aloe vera body wrap to cleanse the skin and open pores. 3. Slim Thighs (8 oz bottle): As seen on TV. Maximum toning and sculpting results are achieved by applying every night. Noticeable toning and inch loss can be achieved in just a few weeks. 4. Aloe Vera Body Wash (8 oz bottle): Daily use will deep clean and open pores, eliminating clogged pores. The body can then excrete toxins and natural oils to keep the skin healthy. 5. Aloe Vera Collagen Body Wrap Formula (16 oz bottle) Aloe Vera Collagen Enriched recipe which has been enhanced with Vitamins, Minerals, and Amino Acids, is our signature body wrap formula! 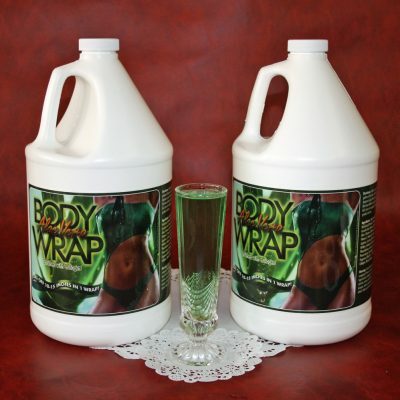 This body wrap formula is 95% pure aloe vera enriched with collagen. 6. Includes Six Brown Body Wraps (50% cotton 50% elastic).